Straighten winding roads and flatten uneven surfaces… the Battlax A40 delivers a smooth, comfortable ride, time and time again. Tailor-made for today’s sophisticated adventure bikes, the Battlax A40 has been developed and tested across the full spectrum of road and weather conditions. 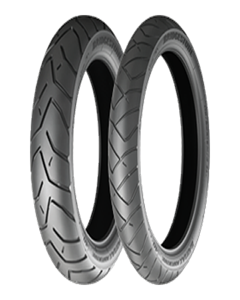 Fusing the heritage of Battlax with the proven stability and durability of the Battle Wing, these premium trail radials let you enjoy both the ride and your peace of mind. Superb traction and stability, particularly on wet surfaces combine sports performance with outstanding safety and versatility. The Battlax A40’s robust construction is your guarantee of long-lasting and consistent performance, whatever the road throws your way.